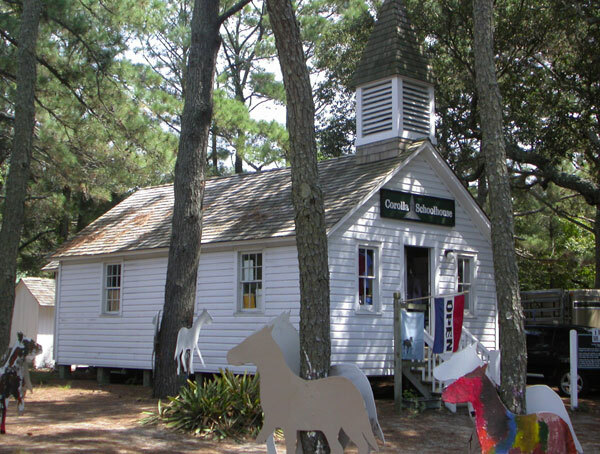 As the Twiddys completed more restorations in Corolla village, their focus soon turned to the historic Corolla Schoolhouse. Having seen & heard of the Twiddys’ restoration work, the owners of the schoolhouse approached the Twiddys to discuss selling. Eager to preserve the last original schoolhouse on the Outer Banks, the Twiddys purchased the schoolhouse and began the restoration in January, 1999. While the exact date of construction is unknown, some say the schoolhouse was built as early as 1890 and others estimate that it was built around 1905 by Corolla residents Sol Sanderlin and Val Twiford. Retired postmaster Norris Austin is the village’s only surviving resident who attended the school. He believes his father and uncles attended the school as early as 1896, when the school was private. Some claim their research has led them to Board of Education meeting minutes that mention the school as early as 1890. This one-room schoolhouse was the first unified Corolla school created by the Currituck County School system in 1905, and school was in session until 1958 when the schoolhouse was closed due to lack of students. In the meantime, the Schoolhouse was privately owned and used as a residence. The building was restored in 1999 by the Twiddys and hosted an interactive educational exhibit on the wild horses of the Currituck Outer Banks until 2012. The one-room schoolhouse will one again educate the children of Corolla as a multi-age charter school in August 2012. 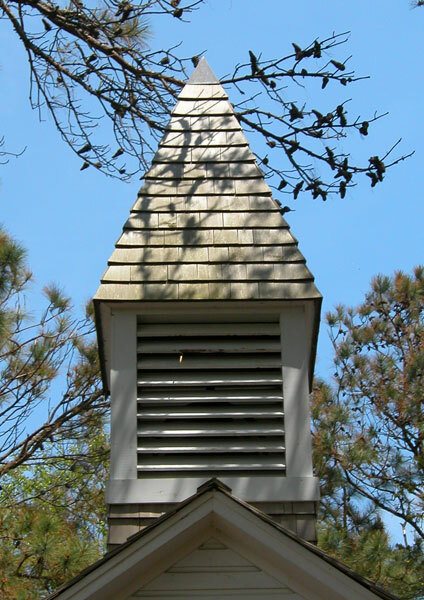 Prior to the Corolla School being established by the Currituck County School System in 1905 (this creation date is likely the reason why some believe the school was actually constructed in that year, rather than earlier), children were divided up amongst several small schools. One school was for the children of government employees working at the lighthouse and lifesaving station, one was for children of local fishermen and one was for children living in the heart of Corolla village (if the Corolla schoolhouse was, in fact, constructed before 1905 as some believe, it is quite possible that that is where these children attended). These schools were funded by the students’ parents. Introduction of the unified Corolla School created by the county provided a teacher, textbooks and standardized grading. The school accepted children of all grade levels and children from the nearby villages of Wash Woods, Seagull and Penny’s Hill were bused down the sandy beach in later years. The rear board-and-batten extension was added to the south end of the building at the village’s peak in the 1940s to accommodate more students and a lunchroom. The extra 10 feet provided just enough room for desks to be arranged in such a fashion that everyone could see the L-shaped blackboard. One teacher, who often lived with a village family, taught first through twelfth grades, which might explain why there was a new teacher almost every year. Students were taught by grade, one group at-a-time and taking turns using the blackboard and reciting lessons. While the effectiveness of this teaching technique is arguable, former student Norris Austin claimed that the exposure to the older children’s lessons accelerated the learning of younger students. Trouble-makers and chatty children were crowned with a dunce cap and sent to the corner of the room. Smells of homemade hot lunches filled the schoolhouse each afternoon and for a nickel, students could dig into a healthy and substantial lunch of something like ham & cabbage and hot, buttered biscuits. In later years, the lunchroom was occupied by the high school students and the kids were on their own for lunch, usually either running home or brown-bagging it. After lunch, the smaller children would retire to the coat closet for an afternoon nap. In the winter, the schoolhouse was heated by a big coal stove. Each morning, the bus driver would light the coals before he began his route, rendering the school warm and cozy upon the children’s arrival. Each spring, windows were lifted, ushering in warm breezes…and all varieties of insects. Not only was the schoolhouse used for traditional educational purposes, it was also used as a community center of sorts. Village meetings were conducted at the schoolhouse. Because the County’s contribution to the school was limited to the teacher and textbooks, it was up to the community to pick up the slack. One Saturday night-a-month, a country-western band would come down from Virginia, drawing a large number of villagers, visiting hunters and Coast Guardsmen who were ready to kick up their heels. Each October, students would host a Halloween carnival fund raiser that included cakewalks, apple-bobbing and a “go fish” pond. Periodically the students would perform plays that they’d written themselves. Such events would always bring a large attendance, and proceeds went toward library books and playground equipment for the school. Although there were no official school sports, students organized themselves into an assortment of “intramural” teams. Softball and volleyball teams were created, evenly distributing the older and younger children. Sports equipment was also paid for by the children and their parents. Reportedly, 60 children attended the school in 1944. In 1945, after the war, the number of students dwindled as families moved out of Corolla in search of jobs on the mainland. By the mid-50’s, the school bus was down-sized to a four-wheel-drive Willys station wagon driven by Corolla Postmaster John W. Austin. In 1955 there were only five students enrolled, three of which lived several miles up the beach by Penny’s Hill. In 1958, only three families resided in Corolla village and Currituck County closed the school due to lack of students. Though no longer serving its originally intended purpose, the Schoolhouse continued to be a part of the community. Boys attending Corolla Academy, a summer school held at the Whalehead Club from 1959 to 1963, set up a pool table in the main room and used the space as a recreation hall. Once the Academy closed, however, the Schoolhouse sat empty for many years. In the 1970s, it served as a private vacation home. When restorations began in the winter of 1999, there was much to be done in order to bring the building back to its original façade. The old bell was badly corroded by the salt air. Most of the foundation was rotten. The previous owners had painted the white clapboard exterior red and covered the cedar roof shingles with asphalt. The bead board walls and pine floors were covered with wall paper, sheetrock and other materials common to more modern structures. Original materials were revived in order to maintain authenticity, and similar materials were well-researched and sought after if replacement parts were necessary. Old photographs and recollections of locals were closely followed in order to achieve an accurate representation of the original schoolhouse. The building was jacked up so deteriorated sills could be replaced. Having the opportunity to walk under the building revealed the many varied timbers that were used in the floor system. Several timbers were clearly ship timbers that had been salvaged from a wreck. The early residents of the Currituck Outer Banks were very resourceful in construction because supplies were scarce on the remote barrier island. As a result, materials were quite often salvaged from shipwrecks. Even down to old nails found on the beach, villagers were nothing if not resourceful. During the restoration, workers found an old Valentine, a Daily Reader, pencil nubs, schoolwork dated 1906, a library book overdue since 1927 and a seven-for-one-cent candy wrapper from under the floorboards and behind the walls. From the belfry, restorers found a century-old collection of stones that had been thrown in an attempt to clang the bell. The old bell was badly deteriorated, so a replica was installed. The original chalkboard, windows, cupboards and pine floors in the main room were preserved. Desks that were used in the old Colington Schoolhouse were donated. A rope hangs on a hook by the door, tempting visitors to chime the school bell. With its louvered belfry at its front gable, white weatherboard exterior, a chimney and two frame privies out back, the schoolhouse looks very much the same today as it did more than one hundred years ago. Once restorations were complete in 2000, the Twiddys utilized the space as an office. In 2002, the schoolhouse began housing educational exhibits focusing on the history of Corolla village. The first exhibit reflected a “schoolhouse” theme, and was hosted by long-time village resident Shirley Austin. There she told stories of the village as it once was. In 2004, the Twiddys transformed the space into the Corolla Wild Horse Museum, which remained until 2012, when it relocated across the street to the Parker House. Striking photographic and video images of the wild horses combine with educational interactive exhibits and are beautifully displayed amongst original schoolhouse memorabilia. The Twiddys’ desire to continue the schoolhouse’s original role in educating was successfully achieved. In August 2012, the one-room schoolhouse will one again educate the children of Corolla as a multi-age charter school. Both children and adults alike gain insight into the lives of the area’s wild horses, the schoolhouse and historic Corolla Village.